Test your appointment calls reason for calling and get your cold calls off to a great start. You can now check the effectiveness of the reason for calling that you are using on your sales appointment calls. This simple test will show you if the benefits you are using to grab the prospect’s attention are working. It will let you see the impact of your reason for calling from a prospect’s perspective. And it will help you to make changes to make your appointment call Introduction the best it can be. At the start of your sales appointment cold calls you have the Introduction Stage. This is where you introduce you, your products or company, and add benefits to motivate the prospect to listen to you. You should also be using a, reason for calling, to explain to the prospect exactly why you’re calling. Do you ever test your appointment calls? 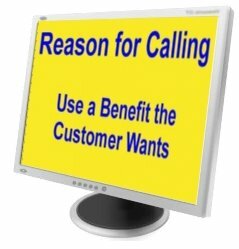 Do you test the effectiveness of your reason for calling? Very few people do, and very few sales trainers show people how to test appointment calls. Have you ever had a sales call and two minutes into the call you’re still not sure why the sales person or appointment setter is calling you? Test your appointment calls and the reason for calling that you use should stop that happening and clearly explain the potential benefits the prospect could gain by listening to you. What if two minutes into your call the prospect doesn’t understand what you can do for them, or isn’t impressed by the benefits in your reason for calling, maybe you should test it just in case. Now you’re thinking about whether your reason for calling is working or not you might want to test it. If you find that it can be improved you could stop some of the objections that you get in the early, Introduction Stage, of your sales appointment calls. Smoke screen objections, excuses to stop the call, and even hang ups, are all signs that the prospects aren’t seeing the potential benefits of talking to you and possibly meeting.